PROMPT: Write a song in a different tone (emotion) than you’re used to writing in. This prompt comes from the fact that when I look over my songs, almost all of them have Am and E in them. In other words, they are usually sad, slow, and dark. Not always, but usually. Today, the goal is to try your hand at a different sort of song than you’re used to writing. Try learning a new chord and then work out a new chord progression with it into a song. Lord Huron is a band I discovered around December and they are pretty fabulous. 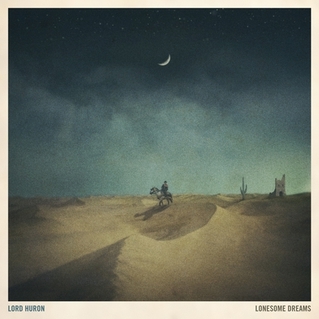 This album, Lonesome Dreams, made a lot of best of 2012 lists. Their music is what I like to describe as what would happen if Peter Gabriel and Paul Simon had a love child. In the West. This song is the one of theirs I like the most at the moment. TODAY’S PROMPT: Write a song somehow inspired by a place. This is inspired by Sufjan Stevens’s notion to try and make an album for every state in the union. I’m not sure if he got past two, but one of the states he wrote about is Michigan and Michigan is my home state (and his home state. Whoo! ); I love that album because it’s full of songs about a bunch of places I recognize. What makes his songs compelling, in my view, is that they are really about people. He names a place in the album title and many of the song titles but his albums or songs are really about people living there. Sometimes he directs them to a person living there. 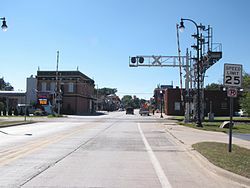 Romulus is a suburb of Detroit–the city that holds the airport. Who knows? Maybe it has a pretty downtown somewhere. If so, I haven’t seen it. If so, most people don’t know about it. From my understanding, it’s pretty much an airport, a field, a bunch of gas stations and car rentals. I tend to like sad, slow Sufjan over happy quick Sufjan, and when it comes to sad, well, Romulus just nails it. It captures Romulus as a weary place, its people sorting through debris left by the car industry’s whirlwind tour through Southeast Michigan (and the United States). I mean, this song would be great even if I knew nothing about Romulus, but because I do, because I’ve been there, it just means so much more. To me, this song IS Southeast Michigan. Or part of it. There is another part of Southeast Michigan that he doesn’t capture in this song, a part that might be better captured in a song called “Downtown While There’s a Tigers Game Going On,” but for when there isn’t a Tigers game going on, this song really captures my impression of the region where I grew up. YESTERDAY’S PROMPT, which I didn’t have a chance to write, was to learn any song you want again. Simple enough. TODAY’S PROMPT: Learn a song you don’t actually like that much. This is my favorite White Stripes song, found on my favorite of their albums: De Stijl. One thing I love about the White Stripes is how simple their songs are, especially the early ones, and this is a good example of that. I also love how coy their lyrics are in contrast to their enormous sound. Two people making a lot of noise: yes. Two people from DETROIT making a lot of noise: yessss. PROMPT: Write a song about how much you love something, but write it in a minor key. Let the words contrast the tune, so the words aren’t said, necessarily, but the tune is. Write a song with really sad words but with a happy tune. My favorite love song by one of my favorite bands, Over the Rhine. The album this song comes from, “Drunkard’s Prayer” is incredible. It tells the story, as this song does, of a couple who revives a troubled marriage. It has some of the saddest, most beautiful songs on it I’ve ever heard–so sad and beautiful that I cannot listen to this album at all if I am in anyway broken-hearted. But I’m not today, and hopefully you’re not either, so check this album out. I suggest listening to it tonight while you make dinner. PROMPT: Learn a pop song. I wrote this prompt in April (as that is when I brainstormed for these) and as I wrote it down today in this here blog template, I realized that I wasn’t exactly sure what officially makes a song a pop song. So I went to Wikipedia, of course. It derives from Rock and Roll. It’s from the 1950s. I guess it has to have a catchy hook to be a pop song; it has to have a verse chorus structure. It’s aimed at the youth market. Maybe everyone knows this already, but because I’m really out of the pop culture loop, I had to look it up. Part of the reason I want to learn a pop song is because I am amused at the challenge of taking, say, a Madonna song and making it work on the guitar. Or maybe a Michael Jackson song. Yes. A folky version of a Michael Jackson song sounds like a good project for today. I had a fun time looking up people’s acoustic versions of MJ songs on Youtube. This one impressed and amused me. PS: I have no idea who this dude is. PROMPT: Learn a song you liked before you turned 13 years old. The first band I ever loved (and there is a chance that it was the first band you ever loved, too–) was They Might Be Giants. Good God, I felt so cool listening to They Might Be Giants. I had to make a last minute emergency drive across the country yesterday and so I didn’t get a chance to make a post. Today I’m playing catch up. PROMPT FOR DAY 17: Learn a Woody Guthrie song. If you know me, you know I love me some Woody Guthrie. I think it’s a singer/songwriter’s duty to keep his music alive, since he wrote hundreds of songs that are considered a big part of (our) American heritage. Check out this biography page if you need more info about this dude. There is a reason I call him Saint Woody. There is a reason I named my dog after him. Because his songs are super easy (G/C/D anyone? ), this prompt shouldn’t take too long to complete. You can find an archive of his song lyrics here. Feel free to add your own tune. You know, like you’re Wilco or Bily Bragg or something. PROMPT FOR DAY 18: Write a song for a child. It could be a children’s song. It could just be a song that’s dedicated to a child. By the way, Woody Guthrie wrote tons of them. This is my favorite children’s song that Woody Guthrie wrote.